Fig. 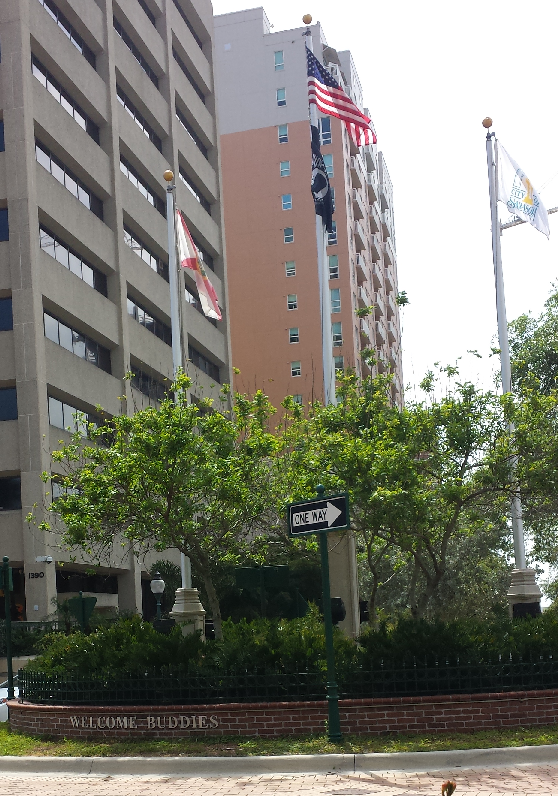 1 Flagpole in downtown Sarasota. To most, the phrase is simply a friendly welcome. If onlookers walk a few feet over, however, they can read an historical plaque that explains the true meaning of who the buddies are and why they are being welcomed. Fig. 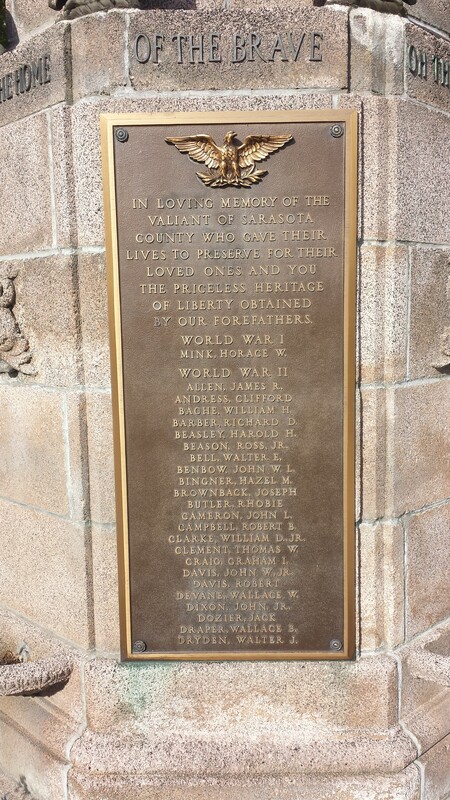 2 Plaque describing the flagpole in downtown Sarasota. Fig. 3 Soldiers in Sarasota’s Armistice Day parade, 1919. On November 11, 1919, the nation’s first official Armistice Day was held in celebration of the armistice signed between the Allies and Germany a year prior. In Sarasota, this day brought with it a second, larger celebration of the flag pole. Fig. 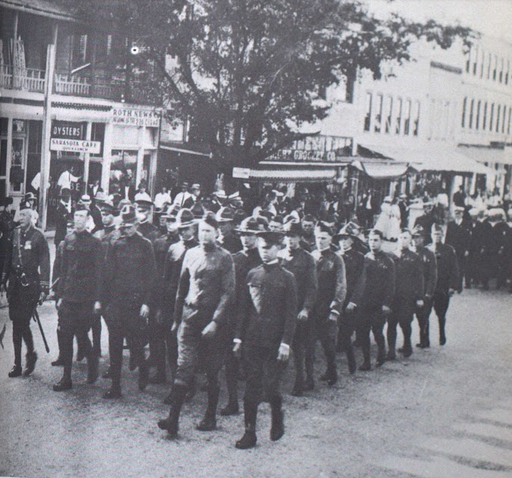 4 Continuation of Sarasota’s 1919 Armistice Day parade, approaching the “Welcome Buddies” greeting before the flagpole. Fig. 5 Dedication of Sarasota War Memorial, Armistice Day, 1928. Though those in 1928 did not know it yet, the Memorial would someday be marked with the names of many Sarasotans who lost their lives in subsequent wars. Names were first added on Memorial Day in 1960.5 The only name under WWI is Horace W. Mink, who died at camp from pneumonia. Unfortunately, since 1960, the list of names has grown (Fig. 6). Fig. 6 Partial list of Veterans on Sarasota’s War Memorial. Fig. 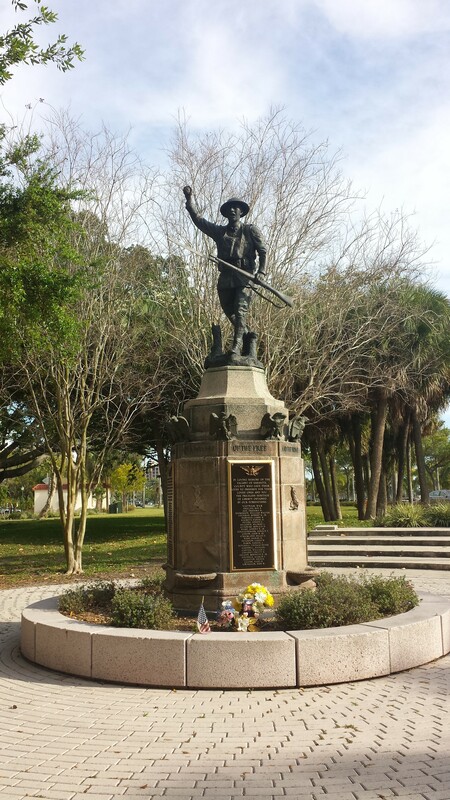 7 Sarasota’s War Memorial in 2015. Fig. 1. “Five Points Flag Pole,” digital photograph, taken by Joy Feagan, Sarasota, Florida. Fig. 2. 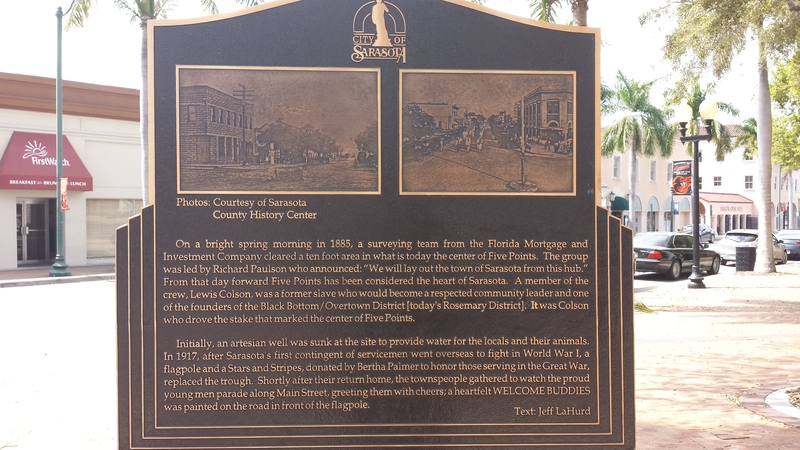 “City of Sarasota Five Points Historical Plaque,” digital photograph, taken by Joy Feagan, Sarasota, Florida. Fig. 3. 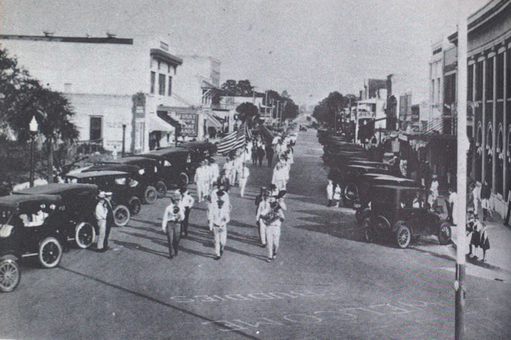 “Armistice Day Parade, 1919,” photograph, courtesy of Sarasota County Historical Resources, Sarasota, Florida. Fig. 4. “Welcome Buddies, Armistice Day Parade, 1919,” photograph, courtesy of Sarasota County Historical Resources, Sarasota, Florida. Fig. 5. 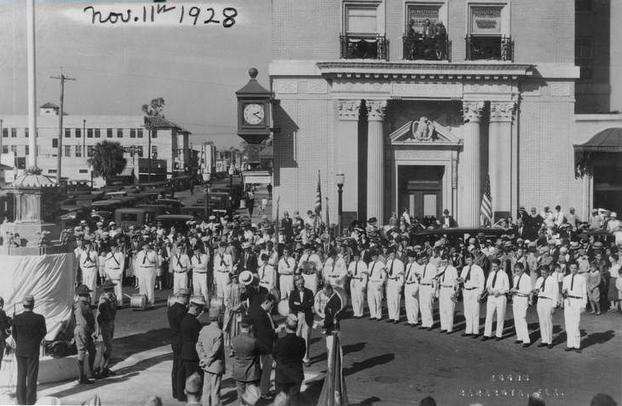 “Dedication of Sarasota War Memorial, Armistice Day, 1928,” photograph, courtesy of Sarasota County Historical Resources, Sarasota, Florida. Fig. 6. “American Legion Sarasota War Memorial,” digital photograph, taken by Joy Feagan, Sarasota, Florida. Fig. 7. “Doughboy Statue,” digital photograph, taken by Joy Feagan, Sarasota, Florida. “Flag Pole Dedicated Saturday: The Ceremonies Were Simple But Very Impressive And Patriotic,” Sarasota-Times, June 28, 1917. Jeff LaHurd, “Five Points was always center of Sarasota’s patriotism,” Sarasota Herald-Tribune, May 25, 2014, www.heraldtribune.com/article/20140525/ARTICLE/140529779?p=1&tc=pg&tc=ar (accessed March 15, 2015). Michael E. Hanlon, “The Origins of Doughboy,” Great War Society, www.worldwar1.com/dbc/origindb.htm (accessed March 14, 2015). Database search “Viquesney, E. M., 1876-1946, sculptor,” Art Inventories Catalog, Smithsonian, http://siris-artinventories.si.edu/ipac20/ipac.jsp?session=1RM663A674811.3702&profile=ariall&uri=link=3100006~!204120~!3100001~!3100002&aspect=Browse&menu=search&ri=1&source=~!siartinventories&term=Viquesney%2C+E.+M.%2C+1876-1946%2C+sculptor.&index=AUTHOR (accessed March 14, 2015).